Also serving communities of Orrstown, Dry Run, Spring Run. There are 13 Assisted Living Facilities in the Shippensburg area, with 2 in Shippensburg and 11 nearby. The average cost of assisted living in Shippensburg is $3,660 per month. This is higher than the national median of $3,346. To help you with your search, browse the 40 reviews below for assisted living facilities in Shippensburg. On average, consumers rate assisted living in Shippensburg 4.3 out of 5 stars. Better rated regions include Fayetteville with an average rating of 4.3 out of 5 stars. Caring.com has helped thousands of families find high-quality senior care. To speak with one of our Family Advisors about assisted living options and costs in Shippensburg, call (855) 863-8283. Shippensburg is a borough in the Cumberland Valley that straddles Cumberland and Franklin Counties. Founded in 1730, it's the oldest community in the valley. Today Shippensburg is home to around 5,500 people and around 13 percent of the population is aged 65 or older. There are two assisted living facilities in Shippensburg and another 16 in nearby communities offering accommodation to seniors wishing to retire in the area. 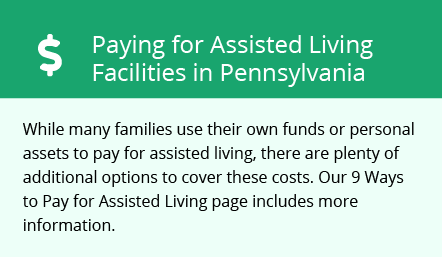 These facilities are licensed and monitored by Pennsylvania's Department of Human Services' Office of Long-Term Living. Seniors who enjoy arts and culture can catch a show at the H. Ric Luhrs Performing Arts Center located at the Shippensburg University which welcomes a wide range of local and international acts each year. In addition, the Cumberland Valley has many art galleries for seniors to explore. Public transport in Shippensburg is offered through Raider Regional Transit. This is a fixed-route service and buses can deviate from the normal route if they have advanced notice. Seniors can apply for the Senior Free Fare Program to ride for free. In Pennsylvania income from retirement funds and Social Security is fully exempt from income tax, as is pension income for seniors over 60. In addition, sales taxes in the state are among the lowest in the country, which leaves more money in seniors' assisted living budget. The Sperling index puts the cost of living in Shippensburg at 93, compared to the national average of 100. Despite this, seniors may still find the borough an expensive place to live; while groceries are cheap, the cost of health care is 13 percent higher than the national average. The weather in Shippensburg can be quite cool, with July highs averaging 85 degrees and lows in January of around 22. Although rainfall in the borough is close to the national average, the town gets 34 inches of snow each year, 8 inches more than the U.S. average. This could keep seniors inside during the winter. The Shippensburg area has few facilities from which to choose in the event of a medical emergency or illness, with the nearest major hospital located in Chambersburg. Assisted Living costs in Shippensburg start around $3,660 per month on average, while the nationwide average cost of assisted living is $4,000 per month, according to the latest figures from Genworth’s Cost of Care Survey. It’s important to note that assisted living rates in Shippensburg and the surrounding suburbs can vary widely based on factors such as location, the level of care needed, apartment size and the types of amenities offered at each community. The Optional State Supplement (OSS) may be available to seniors in Shippensburg who receive Social Security Income. Shippensburg and the surrounding area are home to numerous government agencies and non-profit organizations offering help for seniors searching for or currently residing in an assisted living community. These organizations can also provide assistance in a number of other eldercare services such as geriatric care management, elder law advice, estate planning, finding home care and health and wellness programs. To see a list of free assisted living resources in Shippensburg, please visit our Assisted Living in Pennsylvania page. Shippensburg-area assisted living communities must adhere to the comprehensive set of state laws and regulations that all assisted living communities in Pennsylvania are required to follow. Visit our Assisted Living in Pennsylvania page for more information about these laws.